He’s reinvented himself three times since his undergrad at Dalhousie in the mid-1980s, and now Keith Tufts is returning to school. 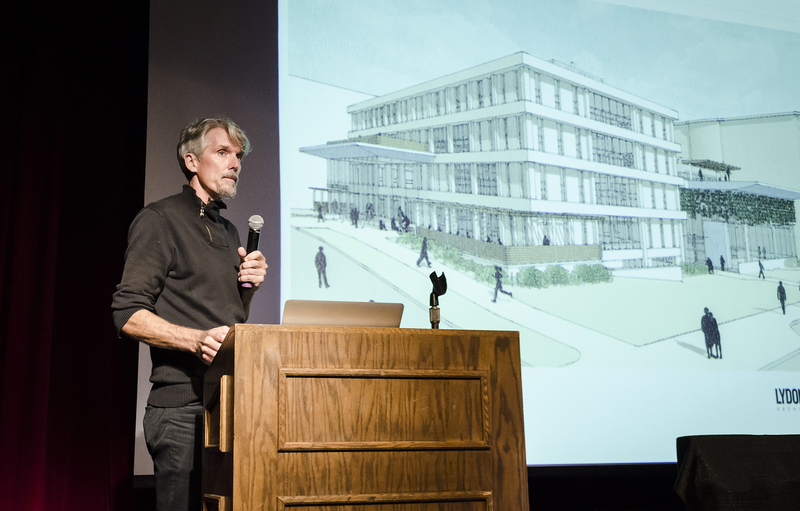 Tufts is one of the top architects at Lydon Lynch, the Halifax-based architecture firm that won the Student Union Building (SUB) renovation contract. While Tufts will be leaving his mark on the SUB, 30 years ago he played an important role in the development of the student union. Back in the early 1980s, CKDU wasn’t technically a radio station. A closed circuit ran through the university’s residences, constraining the music to select areas on campus. Tufts, then a commerce student, wanted to change that. He says he led the fight to unshackle the station, take it onto FM radio and deliver groundbreaking music to the rest of the peninsula. The campaign took up so much time that he took two extra years to graduate. But CKDU is still going strong, broadcasting at 88.1 MHz. After Dal, Tufts continued his passion for music by helping to open the storied Club (and Pub) Flamingo. “I was a serial entrepreneur for a long time,” says Tufts. “That was the scene that Sloan, Sarah McLachlan, and Eric’s Trip, Joel Plaskett and Thrush Hermit came out of. Tufts then spent a three year stint managing Moxy Früvus, Jian Ghomeshi’s folk-pop band, and received a platinum album. But Tufts took an abrupt turn. “I went sideways in media and saw the internet coming,” says Tufts. “I ended up coming back here and I had a team of 60 people working for me doing internet design, down at Purdy’s Warf. “We did the first live sporting event on the internet, ever,” he says. Tufts’ firm, Webworks Worldwide, merged with CYBERPlex in 1998 to form the largest company in Canada, serving banks, airline and television stations. Wright’s studio, constructed by him and his students in the late 1930s, is still a school for architecture. But Tufts says that, despite being offered a place there, he came back to Halifax. He completed a bachelor of environmental design and then a masters of architecture at the Sexton campus before joining Lydon Lynch. Inspired by his family, which includes Robie Tufts, the author of The Birds of Nova Scotia, Keith considers himself a sustainable architect. He says he has been concerned by global warming since the International Panel on Climate Change’s first report in the early 1990s. “The more buildings I can make green, the better,” Tufts says. The new SUB, although lacking official certification, will be a step in the right direction, using less water and no additional energy.